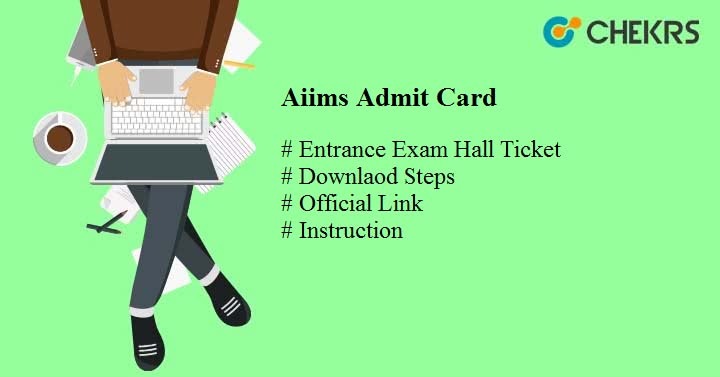 AIIMS Admit Card 2019: The All India Institute Of Medical Science (AIIMS), New Delhi will release the admit card in the May 2nd week 2019. It is a national level exam and also the gateway for the students to get the admission in the various AIIMS institute under the UG ( BSc BSc Nursing BSc Hons Nursing etc) the PG (MBBS MD MS MCh DM MDS M Biotech etc)program. From this post, students are able to get all the details regarding the AIIMS 2019 Admit Card. Latest Update: AIIMS MBBS admit card will be available from May 15, 2019. Before giving the exam student needs to download the AIIMS Entrance Exam Hall Ticket 2019. The admit card contains the important details regarding the examination such as date, day, time and the center of the examination. If the students cleared the exam they will get the admission in the campuses of All India Institute Of Medical Science which is located at New Delhi, Jodhpur, Rishikesh, Patna, Jodhpur, Raipur, Bhubaneshwar, Guntur, Bhopal & Nagpur campuses. After giving all the information regarding the AIIMS PG 2019 here we are mentioning the important dates regarding the admit card. It is expected dates regarding the AIIMS Hall Ticket 2019 is as follows. We will update you regarding the admit card dates after the official announcement given by the institute. Students who know the process to download the admit card from the official site aiimsexams.org they can follow the steps given below. By following the AIIMS Hall Ticket Download steps students successfully able to get the hall ticket. The steps are as follows. Go to the examination section. Click on the link of the admit card. The hall ticket will able on the official portal aiimsexams.org through the online mode only. Candidates report at the examination hall as per the schedule is given on the admit card. Candidates who are unable to bring the documents which are required to at the examination hall will not allow giving the exam. Don’t tear up the admit card as it will also use in the future during the admission process. No electronic gazettes were allowed at the examination hall. Before starting the preparation for the exam students needs to check the AIIMS 2019 Syllabus. The syllabus helps the candidate to know the important topics which were come in the exams. If the candidates go through the syllabus then they will get help at the examination. The institute releases the result after 2-3 months the exam is finished off both the UG and the PG courses as well as for the entrance exam on the official portal aiimsexams.org. Candidates just only required to go at the official portal and click on the link of the All India Institute Of Medical Science Result 2019 the result appeared on the screen. Hope the details given here will help the candidate to get the AIIMS Admit Card 2019 if there are any queries please mention it through the comment box given below. We will soon provide the answer to your queries.